Spares are required to get insurance provided you play more than five games. Cost per game is ~$8.00. Confirm with Bill Cantwell. Hello Brian and David: Please forward to the Buzzard and Gloucester 98 distribution lists. The following is a short report on hockey in the Rio Grande Valley - in McAllen and Mission Texas. Temperature has ranged from 5C to 27C - always affected by the cold fronts coming down from Canada. For the most part, we miss the extremes that they get north of Dallas. 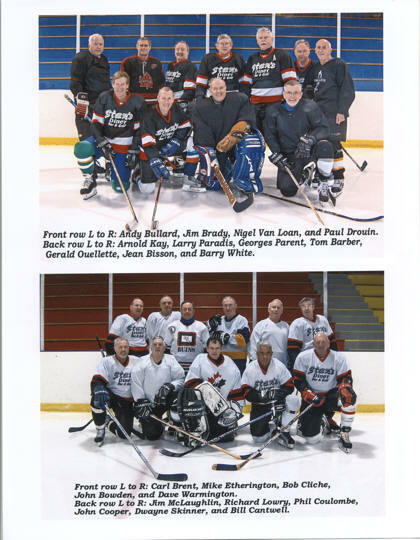 Old Timers Hockey - called the RGV Trailer Trash Hockey Team which has been going for three years and becoming more popular each year. There are 26 regulars and several spares. I am a spare ($15/game)because I didn't get here until 10 Jan when all slots were filled - still have managed to play four games because, even here, people go away on holidays, that is, Caribbean cruises out of Galveston, TX. We play twice a week and get about 75 mins per session and run three forward line and two defence. There are five goalies available. Most of the players are from Canada - Manitoba and Saskatchewan predominate and the average age is 63. The players are all quite skilled and much faster than our two teams, so I must work hard to keep up. Obviously, RVers who bring their gear to Texas are quite committed to the game. Nobody from Ottawa - just Ian Hooles from Morrisburg. One special feature is the tail gate party afterwards - $1 a beer and last week - all you can eat hot dogs for $1. Killer Bee Hockey: The RGV Killer Bee Hockey team plays in the Central Hockey League and belongs to the Berry Conference and has interlocking games with the Turner Conference because in 2010, the CHL joined with the IHL. Teams in the Berry Conference come from the nearby cities of Laredo, El Paso, Corpus Christi and San Antonio. From furthur away are teams from Oklahoma, Louisiana and Mississippi. Some interlocking games will be with Bloomington Minnesota, Fort Wayne Indiana and Rapid City South Dakota, 1,490 miles away. The Killer Bees are not doing well with a record of 15-22-3 and are in last place in their conference. There are 12 Cdns, 5 Americans and one player from Slovakia. There is one player from Ottawa - Brett Clouthier, a 6'5" forward. If you are interested in learning more, check out "killerbeehockey.com"
I attended the game last night against the Laredo Bucks quite exciting. It was Winter Texan night - a promotion night for all the RVers. Tkts $7, hot dogs, popcorn and tacos for $1/per. Arena was about half full - approx 3,000 fans. And if the Bees score on the power play, there is dollar beer for 10 minutes after they score - a bit of a madhouse as all the seniors rush for cheap beer. PS: The golf has been good, too. Monday hockey will be played at Earl Armstrong Arena at 1300. Monday only: September 28 to December 28 2009 13 games $104.00 plus insurance $23.00 total $127.00 payable on your first game. No hockey 12 October Thanksgiving. Monday only: January 4 to March 29 2010 13 games $104.00. Please make cheques payable to the GLOUCESTER 98s SENIOR HOCKEY and have a postdated cheque at the same time dated by 23 December 2009 so I can deposit it and pay for ice rentals for 2010. Wednesday only: October 7 to December 9 2009 nine games $72.00 plus insurance $23.00 total $95.00 payable on your first game. No hockey 11 November Thanksgiving and 16, 23, 30 December, University exams on the ice surfaces. Wednesday only: January 6 to April 7 2010 14 games $112.00. Please make cheques payable to the GLOUCESTER 98s SENIOR HOCKEY and have a postdated cheque at the same time dated by 23 December 2009 so I can deposit it and pay for ice rentals for 2110. First half 22 games plus insurance $23.00 total $199.00. As stated for Monday and Wednesday, make your postdated cheque payable by 23 December 2009 so I can deposit it and pay for ice rentals for 2010. Spares are required to get insurance provided you play more than five games. Cost per game is $8.00. Both the City of Ottawa and the U of O raised their prices and the U of O raised their prices more than the city. at The Meadows on Monday June 9th 2009. The Golf Day information and Registration Forms are now up on the Travellers web site at www.ottawatravellers.ca. Just click on TRAVELLERS GOLF DAY JUNE 9. You can send in the Registration Form and cheque(s) for your entire group in one envelope, or your registration form(s) and cheque(s) can be sent in individually even if you are in a foursome, and we will match everybody up. Just be sure to include the name the REP for your group on the top line of the Registration form and we will match you into that group. Please note that the Golf day is run through the Travellers Athletic Club and its web site in order to facilitate the organization, communication and bookkeeping for the golf day, but that no cost, fees, proceeds or benefits of any kind accrue to Travellers Club. On 30 March, our last Monday game, we will have our usual stag, drinks and pizza. All players are invited to the stag regardless if you play Monday or not. Approximately 1430 at Stan's for card games etc..
We are also planning a dinner dance in early spring. More to come on that soon. because of the natural over-lap and because many of our golfers are in both groups, our group (Over-50 Hockey) and Dave Warmington’s Gloucester Oldtimers have agreed to join together for this year's summer golf day. with the 2 groups, we would likely have more than enough (maximum 80 golfers) for a shot-gun start. this e-mail only goes to those people (now including Gloucester 98s) that are on my current over-50 hockey/golf e-mail list (which isn’t everybody); please be sure everyone in both groups is aware of the date and time. Stag social on Monday 31 March at Stan's for refreshments, chicken wings and pizza. Stag social on Wednesday 11 April at Stan's for refreshments, chicken wings and pizza. Golf Day 2007 was great !!! Once again there was a Gloucester 98s Senior Hockey FUN golf tournament held at The Meadows on Monday 18 June 2007. The social held at Peter/Marion Howe's house was excellent. Refreshments, food and prizes plus lucky draws.